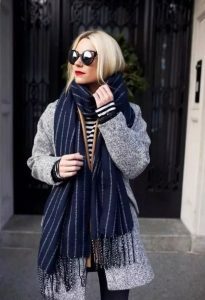 In terms of color, black and white ash is the basic color in the scarf, classic versatile and not picking out, with your winter coat will never go wrong. The red and black collocations are not excessive, and the black circles are piled around the neck and are lazy. Needless to say, in addition to this color, black + gray, black + white, black + black is also very practical. Although white is easy to dirty, but the clean qualities are also very pleasing, secretly telling you that the white scarf can set off our skin color. In addition to the black classics that have not changed for a long time in the big winter, there is also a practical model of gray, which is less black and dull, more simple and luxurious, and more gray and gray. 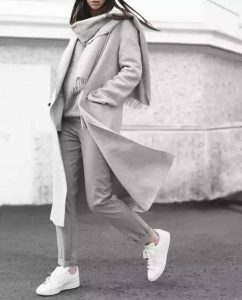 Dark gray scarf will give people a more calm feeling, with light gray fluffy fur clothes, use color to distinguish the level, the fur coat is not vulgar, but on the young lady, wearing a soft and cute temperament. Some people will say that khaki will be old-fashioned and can’t wear the taste. Katie wants to give khaki color today. It comes with an elegant literary atmosphere, and it can definitely increase your gentle temperament with the dark-colored coats of autumn and winter. Beige and khaki are warm earth colors, so you can’t use them together. Bright yellow is also the popular color of this year. This color should be too eye-catching with the jacket. It is just right as an accessory. The color of the jump can well resolve the heavy feeling of the coat. Dark green wool scarf with a strong sense of retro, this kind of dark green, sapphire blue, light pink, turmeric solid color scarf, with the same color coat will be more textured . 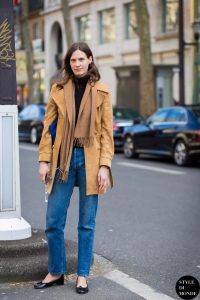 The above-mentioned solid color scarf, to say the second practical, equally versatile, must be indispensable for the checkered scarf, not to mention the lattice elements of this year is so hot, the plaid scarf you bought before should not be thrown, it will definitely be your autumn and winter this year. Must-have. 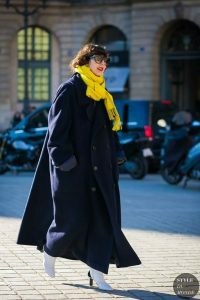 Use a plaid scarf with a coat that tries to choose a solid color. It can easily highlight the color of the plaid scarf and let the plaid scarf light up the overall shape. 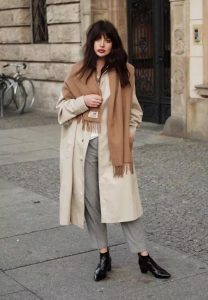 The color of the coat echoes the color of the scarf grid, and it is also easy to create a high-level dress with the same color. 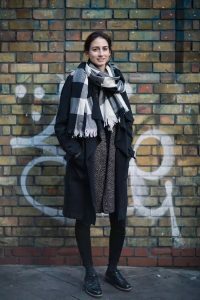 Admiring the minimalist and versatile autumn and winter, Ka Niu also recommends printing scarves as our autumn and winter coat embellishment, simply hanging on the neck, simple and simple just good. This year’s sports scarf has quietly risen. Card girl seems to be less warm and decorative. The most important thing is decoration. If you are going to the street, this scarf must be your dish. PreviousPrevious post:Stylish and warm scarf（2）NextNext post:How should the scarf be worn this winter?